A video/web page library with quick links to over 200 free online video clips students can view at home or in class. Links are organized according to textbook chapters and can be used immediately in the classroom. A description of the Roosevelt University Pseudoscience and Paranormal Lab in Chicago and its research program. Links to free, read-to-use paranormal and critical thinking inventories developed by Dr. Smith. Instructors are granted permission to use current inventories in class without charge. A free online ESP test. A complete detailed annotated syllabus (instructor’s version) for Dr. Smith’s course (both online and classroom) on pseudoscience, critical thinking, and the paranormal. Includes written assignments, interesting classroom group activities, lecture topics coordinated with the text, and selected free online video clips to illustrate core concepts and foster discussion. Are ghosts real? Can the living communicate with the dead? Are astrology and psychic readings accurate? In this groundbreaking book, a leading expert in the field makes sense of these mysteries and many more. 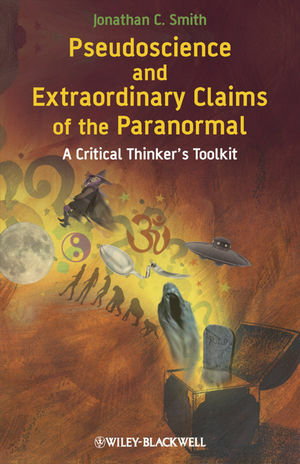 Geared for paranormal believers and skeptics alike, Pseudoscience and Extraordinary Claims of the Paranormal: A Critical Thinker's Toolkit provides readers with a systematic and clear-headed approach for analyzing paranormal claims and distinguishing science from pseudoscience.